We speak to Diptyque's director of operational development, Stephane Le Man, on the opening of the brand's first store in Singapore. Diptyque has made a name for itself as the niche fragrance brand par excellence, having been in the business for over 50 years now. Their candles have decorated the homes of just about anyone wanting to indulge in an immersive home fragrance, and every perfume connoisseur has at least one (or two, or five) Diptyque perfume in their collection. But truth be told, the original Diptyque brand was never meant to produce any fragrances. It started out as a labour of love for the three brand founders, none of whom had any prior experience with fragrances—Christiane Gautrot was an interior designer, Desmond Knox-Leet was a painter, and Yves Coueslant was a theatre director and set designer. Diptyque the store was originally created to sell artwork by the founders, as well as curios that they found on their myriad travels—silks, small home furnishings and the like. The Diptyque name itself was coined after the word diptych, which is a flat piece of artwork (such as a painting, drawing, or photograph) that comprises two different panels. The contrast of the two adds to the meaning of the overall piece. In the past, diptych might have been alluded to the clash of cultures amongst the items that the founders sold. Today, the diptych meaning lies in the pairing of each fragrance with its own unique illustration on the label, each one created by a skilled artist. The illustrations differ between the front and back of the bottle—if you don't believe us, just turn over your bottle of Philosykos and peer at the back of the illustrated label. Diptyque's story is one that is full of small surprises and that brings pleasure to the owner of a Diptyque product. We speak with Stéphane Le Man, director of operational development at Diptyque, to find out more about these surprises. How does the history of the co-founders come to shape the brand? Stephane Le Man (SLM) The way the first fragrance was created, the same creative process is still being used today. When we create a fragrance, we have three main parts—it’s a collaborative process—we have a story, a remembrance, and a journey that forms that spark of inspiration for the fragrance. And we have a perfumer and illustrator. The three of them are working together, not always in the same order. Sometimes it starts with an illustration, sometimes it starts with a scent, sometimes it's a memory that you want to reproduce. The three work together as a collaborative process where everyone is nourishing each other. Creating a fragrance is an art—there is an analogy between the painter’s palette and the perfumer’s use of raw materials. When he created his first fragrance, Desmond (one of the co-founders) did a paste by mixing things that smelt good to him—such as leaves—and he went to a perfumer friend to ask him to recreate this. That’s why the illustration is so important to us—it’s always on the bottle, handmade and in ink. The artistic background of the founders is very important for us—it's something that's still very alive. For example, the way we create fragrances, it's very faithful to the way we used to create. One of the three founders, Desmond, is a painter. Being a painter, he thought of using the raw materials of a fragrance the way that a painter would use colour pigments to create a painting—just that instead of a painting, we are creating an olfactory landscape that provokes emotions. We really consider the creation of a fragrance an art. What Makes A Perfume Worth Wearing? What do you think makes Diptyque so unique? What is it about Diptyque that attracts such a cult following? SLM With 50 years of history, there's a strong cultural heritage and authenticity that the brand comes with. The richness of the stories and drawings in our archives is really breathtaking—people are drawn to this authenticity. We pay so much attention to detail: if you look at the way we conceptualise a fragrance, such as how both the front and back labels are illustrated, which allows you to discover different facets of the fragrance. We try to be free-spirited, not just following trends, giving a lot of freedom when it comes to creative expression. For example, Dimitri Rybaltchenko, who has worked closely with Hermes to create silk scarves. We love his work and how he works with ink stains, to draw what he sees. He manages to transform what appears to be a simple stain at the beginning into a beautiful design. For one of our new fragrances, Fleur de Peau, there's a seascape, picturing the beautiful love story of Eros and Psyche from the greek myths. Musk is extremely sensual and it goes very well with this greek legend—there is a strong link between illustration, scent, inspiration. Safia Ouares, she has a very different work, she's very precise. She takes a long time to draw tiny, precise details. She was inspired by the earthy side of the patchouli scent of Tempo (made with patchouli sourced from Sulawesi), which reminded her of the creation of life and the strength of nature, such as the volcanoes in Indonesia. It reminded her of a shaman in communion with nature, and of sedimentary layers of earth. For us, it was really an invitation, a psychedelic trip into nature. Diptyque has been in Singapore for a long time, in Escentials. 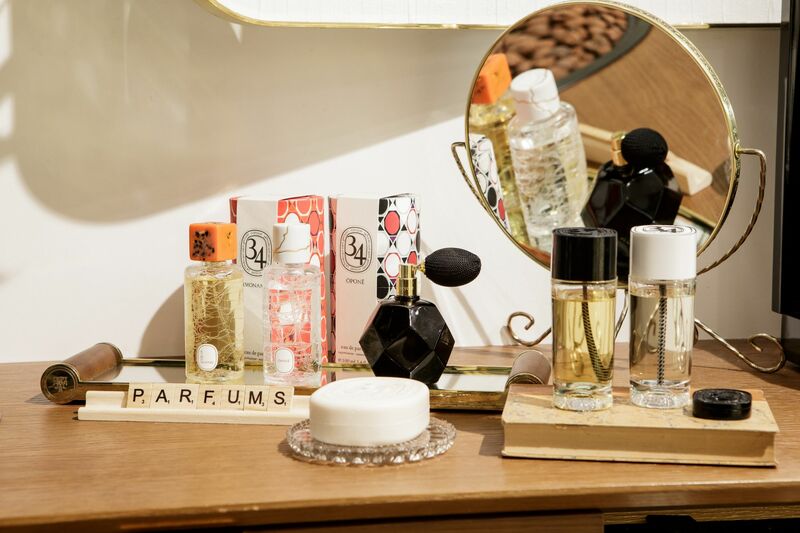 What can a full retail store add to the Diptyque experience? SLM Retail stores are very important for us—it expresses the full essence of the brand, where we can present the richness of our collections. We have the opportunity to share rituals with our guests: we have this fragrance counter inspired by a painter's box, which displays little jars containing the fragrance that look like painting boxes. We have 37 fragrances at the moment. We also have a pillow that we use to smell the back of a candle—that's the best way to get a true sense of the candle. That is what it will smell when you burn it in your room. Another ritual is the gift wrapping. Every fragrance has a specific combination of three colours—each colour is chosen depending on the ingredients in the candle. Gift wrapping is really key—we have had this tradition for 50 years, with unique colour combinations for each fragrance. It's really a journey through the senses—there's the touch of the gift wrapping paper, the creasing sound it makes when you open it, and the smell that it contains even before you open the box, especially for the candles. We have some very loyal customers who know the colour combinations by heart, big fans who sometimes know the brand even more than we do! Tell us a bit about the design of the store. It looks so different from the original on 34 Boulevard St Germain in Paris. SLM For us it's always very important to have all the details in relationship to the location of the store. We like to pay tribute to the local culture—the Diptyque vision of Singapore as a garden city inspired the use of green forest marble, which is sourced from India, as well as a structure covered with foliage. We have a dedicated team designing every project from the beginning to the end, and designing every Diptyque store in the world. We sometimes use local materials . Recently we opened a store in Kuala Lumpur that uses wood sourced in Malaysia. Asia is a very important area for us. We're happy to open a store here this year and another store in Kuala Lumpur; 2018 is an important year for us, it's our 50th anniversary. We also have other stores in the north of Asia in China and Japan. What's the next step for the brand? SLM The next step for the brand is to not compromise on quality in all our products and marketing, and I think we should continue with that as we expand and enter new markets. Quality should be an obsession.